DWYANE Wade and Lebron James form part of Miami's dreaded three-headed monster that includes Chris Bosh. But Sunday night at the United Center, the Heat's Big Two was just an average pair who did little as the Chicago Bulls run away with Game 1 of the Eastern Conference finals, 103-82. The 6-foot-4, 220-pound Wade, one of the NBA's notorious closers, was held to a 18 points on 7- for-10 field goal shooting. King James, meanwhile, looked like a commoner. The 6-foot-9, 250-pound ex-MVP managed only 15 points on 5-of-15 shooting. Make no mistake, James and Wade didn't have the night off. They came to play alright, but a swarming Bulls defense that was physical and relentless, simply took the fight out of the two All-Stars and the rest of the Heat. Wade and James pile points by using either their speed to blow past defenders or their strength and individual skills to post-up one-on-one. But there would be no such luxury in Chicago. The Bulls built a nearly impenetrable wall in the shaded area, matched the Heat's speed, and threw multiple defenders each time Wade and James drove to the hoop. The Heat thrive in the open floor, where they score easy points off turnovers, like the pair of dunks they had at the start of Game 1. But the Heat finished only with 10 fastbreak points the rest of the way as the Bulls had only 9 turnovers and refused to engage Miami in a fastbreak versus fastbreak free-for-all. And here's the killer: Chicago won the rebounding battle 45-33 including 19-6 on the offensive boards which gave the Bulls a huge advantage on second-chance points, 31-8. With the Heat cooled down by their defense, the Bulls then unleashed their offensive firepower and nailed 10-of-21 3-point baskets to finish off Miami after a tight first half that was knotted at 48-all. Reigning MVP Derrick Rose led the Bulls with 28 points and 6 assists. 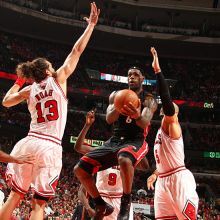 Luol Deng had an all-around effort that netted him 21 points, 7 rebounds, 4 steals and 2 assists. And Carlos Boozer continued his recovery from a turf toe injury, finishing 14 points and 9 rebounds. THE BULLS bench was as good as advertised, manifesting their dominance by outslugigng their counterparts, 28-15. Coach of the Year winner Tim Thibodeau used five players off the bench and all of them played their hearts out on defense and contributed on offense, most notably Taj Gibson who had 9 points and two nasty slam dunks that sent the United Center home crowd into a frenzy. Rose and company have every reason to be ecstatic, but by the same token, they know they have a long ways to go. This, after all, is a best-of-7 series. And up against a team with James and Wade, nothing is a given. What's a given though is that the Heat must do a better job of rebounding the ball. They must also take care of the Spalding, not turn it over 16 times like they did in Game 1. Most importantly, Miami must share the ball. The Heat only had 11 assists to Chicago's 23 in that forgetabble Game 1. Not only did the lack of ball movement make Miami's offense weak and predictable, it also allowed the Bulls to easily collapse on either Wade or James. Chris Bosh did have a stellar outing, 30 points on 12-of-18 shooting. But the Heat can't beat the Bulls four times in a series with Wade and James taking a backseat on scoring. Conversely, the Bulls can't win with just Rose doing all the scoring, that's why its imperative for Chicago to get other Bulls involved, which was exactly how Game 1 turned out. It's not easy to analyze an NBA series, and I'm not about to pretend being good at doing it.